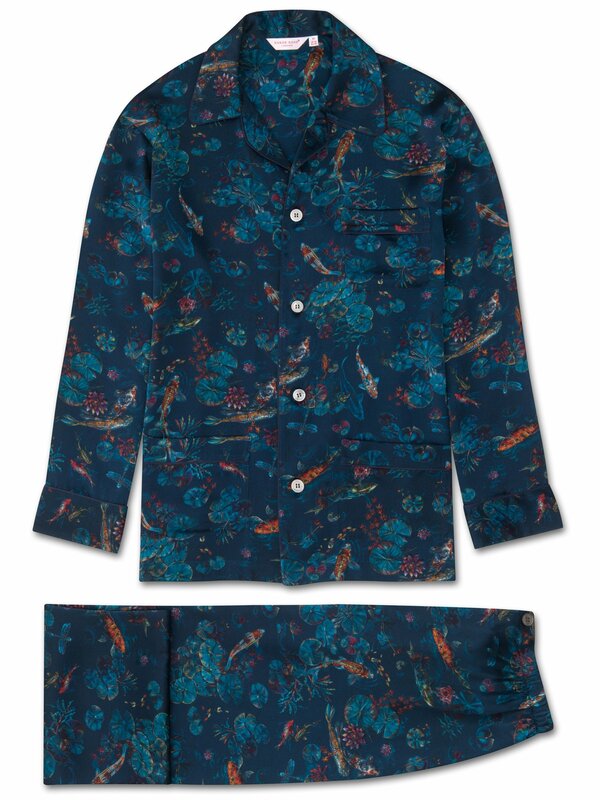 The Brindisi 28 silk classic fit pyjamas feature our stunning hand-drawn print of the season that utilises a dark navy background to offset the colourful, inky illustrations of koi carp swimming amongst the lily pads - traditionally a symbol of luck and prosperity in Japan. Handmade in our workshop in Cheshire, England, the Brindisi 28 classic fit pyjama is cut by hand to ensure we uphold the supremely soft and elegant satin finish. Produced in extremely limited quantities and the result of hours of loving craftwork by our skilled pattern cutters and seamstresses, you're sure to feel like royalty while lounging at home in our comfortable and beautiful silk sleepwear.